What Type/Style of Railing is Right for My Stairs? Stair railings are more than functional parts of your stairs, often adding an aesthetic appeal to staircases. While you may have given a lot of thought to the bespoke staircase design for your home, the railings might have been overlooked. Whether your home has a country, rustic appeal or a modern, minimal style, choosing the right railing is important. 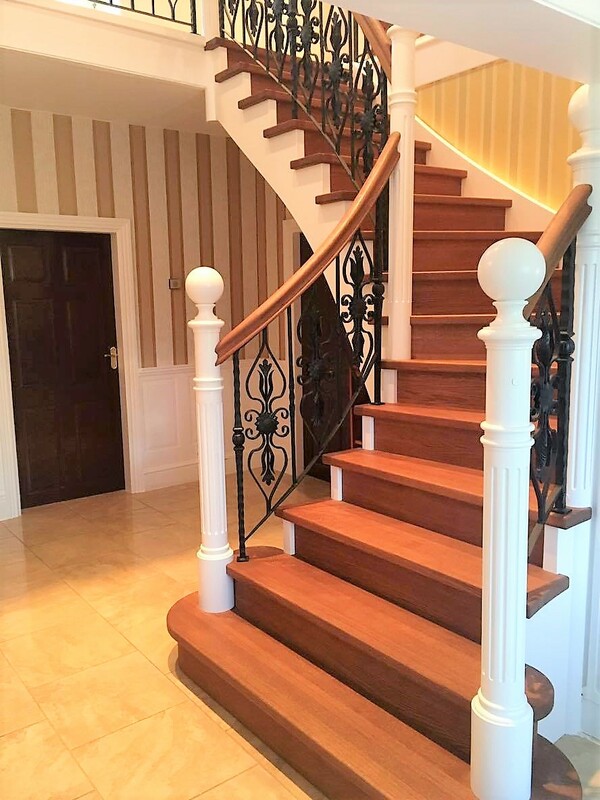 When it comes to choosing the right railings for your stairs, consider the architecture and design taste you prefer, from the colours to the influences you enjoy. If you like unique artwork and artisan details, your handrail can display this same quality. Having the stairs and railing synced to the rest of the house adds a delightful aesthetic appeal. For example, if you have an older home with Victorian panelling, matching the rails to the wood and adding trim in line with the panelling gives an updated but not out of place look to your stairs. When choosing the stair railing, be sure that you are thinking of the safety aspects. UK homes need to follow building regulations set out by Health and Safety Executive, which includes that stairs have handrails at an appropriate height which contrasts with the surroundings. However, safety does not mean boring, and you can still make sure your railings stand out, such as using wrought iron or polished wood. Opt for a style you love and make sure it meets the regulations. Your stairs railing does not need to make a statement, and often the “less is more” style is desired. Why not consider glass, stainless steel or copper to create a minimal look for your railing; these materials are fantastic options that match many modern homes. There is loads of inspiration around you, from interior design magazines and blogs to the modern buildings in your area. On the other hand, you may want to make your stairs a statement piece in your home, and the railings can help. Using contrasting colours, bold shapes and materials for the rails can transform your stairs into an eye-catching focal point, and have visitors asking who designed them! Wood – Wooden handrails are a popular choice; traditional, aesthetically pleasing and can fit with any style. Hardwood is a versatile material, which comes in variety of species, timber grain and colours. You can use a wooden handrail in keeping with a modern, simple design or you can carve it and curve it to make it stand out. Wood is easy to polish, stain or paint also, depending on your taste and preferences. Metal – Metal handrails often give that industrial-style look but can also be used in a classic and modern design. Metal railings can follow a simple design, depending on your chosen metal and can be used to contrast the walls and floors. Stainless steel handrails have a cleaner, modern appearance but are challenging to integrate, unless there are other matching steel elements around the house. In modern homes, metal is ideal if you like a straight lined and angular style. Artistic – Staircases offer a chance to add a decorative touch to the décor, and the railing is where you can be most creative. Minimal designs, such as floating wall-mounted rails, often with lighting underneath, gives it the effect of being suspended in space. Artistic wrought iron rails can add a grandeur, whilst steel or glass can turn your staircase from traditional to modern. If you choose glass balustrades with no handrail at all, it would offer an open feel to the stairs and draw attention to the staircase itself. Combining materials – Combining two materials; metal and glass or wood and metal, for example, can mix the aesthetics creating a unique and personal structure. Wood still holds a traditional appearance, although with a wide variety of contemporary timber finishes it can be used to compliment a modern stair designs. Using glass with a metal handrail strengthens the railing’s structure and offers a pleasing, clean finish. There are so many options available to you, be sure to consult with a specialist before going forward with a final production design. Here at WoodenStairs we develop the stair designs, offering advice and helpful visualisations. In the meantime, why not check out some of our previous blog posts about stair designs for small houses and handrail design ideas.